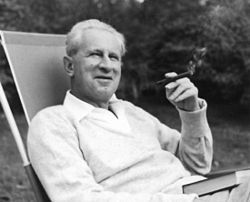 Herbert Marcuse, associated with the Frankfurt School of critical theory, is celebrated as the "Father of the New Left". ↑ Carmines, Edward G., and Geoffrey C. Layman. 1997. "Issue Evolution in Postwar American Politics." In Byron Shafer, ed., Present Discontents. NJ:Chatham House Publishers. Grant Farred (2000). "Endgame Identity? Mapping the New Left Roots of Identity Politics". New Literary History. 31 (4): 627–648. JSTOR 20057628. doi:10.1353/nlh.2000.0045. ↑ Jeffrey W. Coker. Confronting American Labor: The New Left Dilemma. Univ of Missouri Press, 2002.